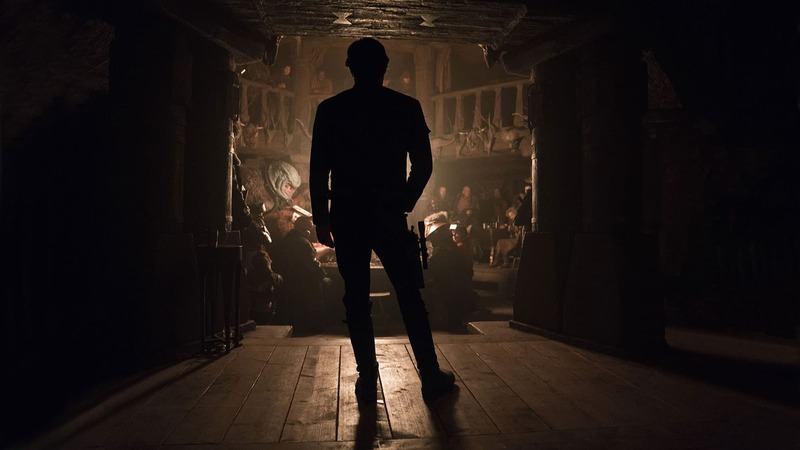 This is part one of our two part look at the latest Lucasfilm movie, Solo, A Star Wars Story. In this story we speak to Rob Bredow who was not only the visual effects supervisor on the film and who was also a co-producer. (Plus we explore some fun facts behind the scenes, trivia and cameos). In part 2 we have a detailed look at the on-set technology that the team used during the film making. 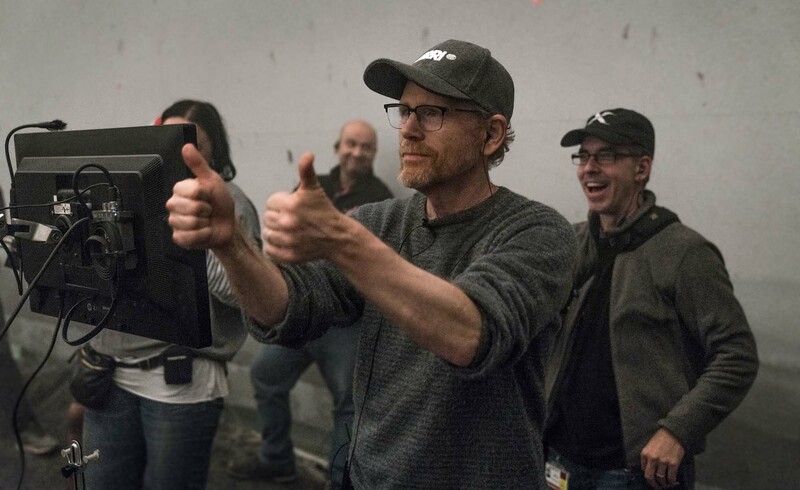 Rob Bredow standing behind Director Ron Howard on the set of Solo. Rob not only was the production VFX supervisor but a co-producer on the film. As we reported, last month, Industrial Light & Magic (ILM), recently appointed respected vfx veteran Rob Bredow as Senior VP, Executive Creative Director and head of ILM. Bredow is in charge of all of ILM’s four global studios. This all came about as he finished supervising on Solo. 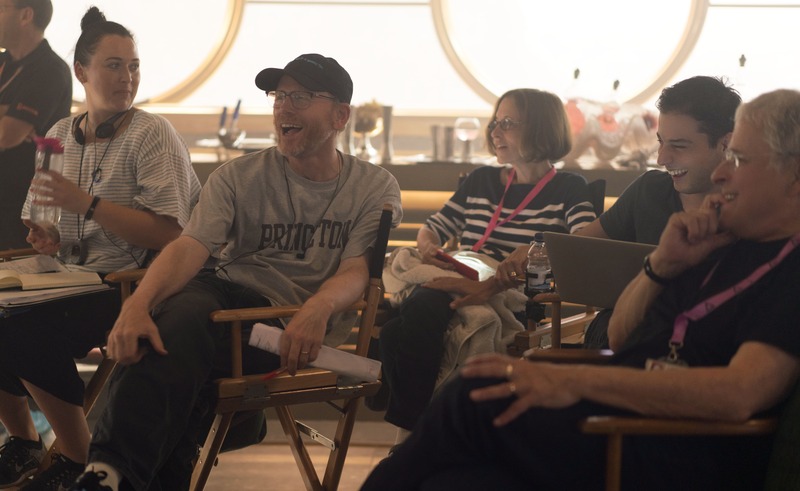 Ron Howard was brought into the film late, when the previous directors left and Bredow played a key role in helping Howard get up to speed and finish the film. Unusually for a VFX supervisor, Bredow was also a co-producer on the film. "I was really honored when Kathy Kennedy gave me the co-producer credit along with John Swartz and Jon Kasdan," he told fxguide. "I think it was in response to the roles that we had on the film. I was really brought in to Ron Howard's creative process in a real close way". Howard asked Jon Kasden to stay on set with him to 'touch up' the writing. 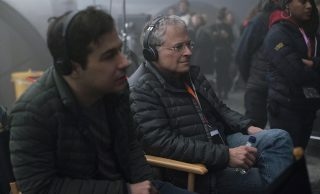 Jon Kasden and his father, Lawrence Kasdan (Empire Strikes Back, Return of the Jedi) were the two writers on the film. Ron Howard wanted Jon Kasden to be collaborating with him as he was filming the scenes. Howard also asked John Swartz, who had worked on some of the other Star Wars movies to direct the splinters unit, as Ron Howard himself needed to get a lot of shots filmed in a very compressed schedule. 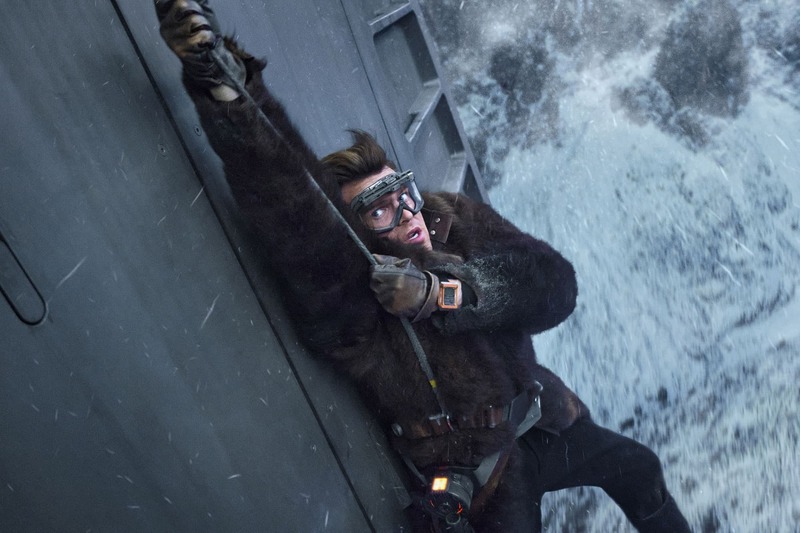 Finally, Howard asked Bredow if he could stay with the director on set, in part, for the visual effects, to make sure that sequences like the Kessel Run and the Train Heist came together in a way that was consistent with all the planning that had been done to date. In addition to his role looking after visual effects, Howard asked Bredow to join him and offer his opinion "on just kinda for anything else that came up", Bredow joked. "He opened my role up beyond the traditional visual effects role. It was just really great to be able to say things such as, 'you know, I think that character shouldn't be saying this or that' and just offer different ideas, making contributions through the whole film". Bredow adding, "I was a very, very fortunate to get to be involved in aspects outside direct visual effects as one of the filmmakers on the project. I felt really honored to get the co-producing credit". Ron Howard is known as both an actor's director and also a very inclusive collaborative film maker. His approach is that everyone who is on his set, is assumed to be intelligent, talented and there to do a great job. He has spoken about this collaborative directing approach to film making in the past and Bredow commented that he very much what he saw himself from the famous director. "I experienced that on this movie. That's exactly how he shows up on the set. He expects people are bringing their A game. And I have to say his method of managing creative people is one of the most satisfying methods, I've ever experienced". Howard famously trusts his department heads and often tells them the effect or story point he is trying to communicate and not the detailed way to do achieve the result. "He asks for the things he needs, not specifically what needs to be done. We asks for what he wants to accomplish for the story, and then he lets you pitch various versions and the way you might want to get there" explained Bredow. "I honestly think that he gets some of the best work out of people because of that freedom and the creative opportunities that he gives to the crew and the team at ILM". Bredow commented that this collaborative approach works for small points with VFX, or Art Department etc but it also works at the very highest level. For example, ILM has a group known as the "Creative Brains Trust", which is a team of senior supervisors, many of whom have worked on numerous Star Wars films. People like Dennis Murren and John Knoll. The Brains Trust was invited to a specific screening by Howard. "We screened the movie and then Ron and Larry and John Kasman sat down with us for probably a couple of hours. This was when Ron was formulating a last big round of changes that he wanted to make in the story". After the meeting, Howard told Bredow, "you know, I expected to get real technical notes. Star Wars specific notes, such as oh, that's the wrong button to hit in the Millennium Falcon, and other little specific things". But instead he told Bredow, "what I got was a bunch of filmmakers giving me great story notes on my movie". And the Director added, "I think that's the amazing differences that you have at ILM, you have this really experienced team of filmmakers and I don't know if people realize what a great resources that is for a Director". Bredow felt that this was not only a real compliment to the ILM team, but showed Howard's approach of hearing people out and collaborating. "Ron Howard is in charge of his movies, there is never any doubt about who is in charge. Ron knows what he's doing, he collates all these ideas and inputs into his plan and then he is able to move forward and do what he thinks will work for the story. I felt incredibly fortunate to get to work with him on this show " comments Bredow. This approach to film making also influenced Bredow's own approach with the ILM sequence leads and artists. Without a director nit picking and poking at pixels in review, Bredow and the team could spend their time improving shots and making the story points work. Sometimes in reviews, even when the team was showing a shot only say 70% done, Howard would said, 'No, it looks like you know what you're doing. Yeah, you can just finish it from here". For Bredow, that trust in the ILM team to finish the last 30 percent, was key. The last part of a shot can be very fiddly technically, "we were able to achieve a high degree of finesse because we weren't trying to second guess what little details we're going to be important to someone. Instead we could do technical finessing while Ron remained focused on the big picture, - which was a great gift. We aimed to make sure we delivered what he wanted, that the story points were working, and he trusted us to do that" recalls Bredow. 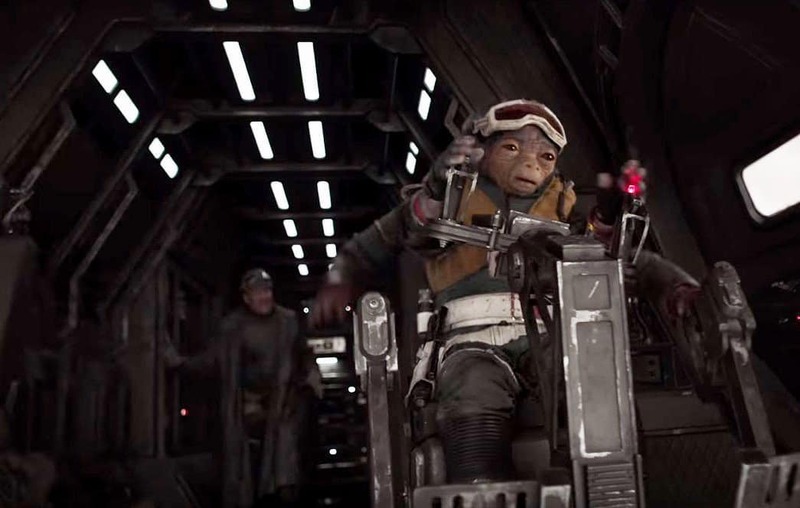 Bredow felt similarly empowered to let the artists do their best work, while also wanting to make sure anything that was important to Howard was maintained during all the vfx work. "We made sure whatever was the main thing in the sequence for Ron, stayed the main thing", he commented. "Fortunately I'm working with these really talented artists at ILM who have an obsession for a high quality work" comments Bredow. "The way that Ron treated me, is the way I worked with the various supervisors at ILM. When I was reviewing the last technical items and they're knew how to fix the shot, I was able to say ' fantastic, great, do it. We don't need to talk about all those details. You guys know what you're doing'. That philosophy of Ron's permeated throughout the film, which I think benefited that film, we got good quality work and all in a pretty challenging schedule". 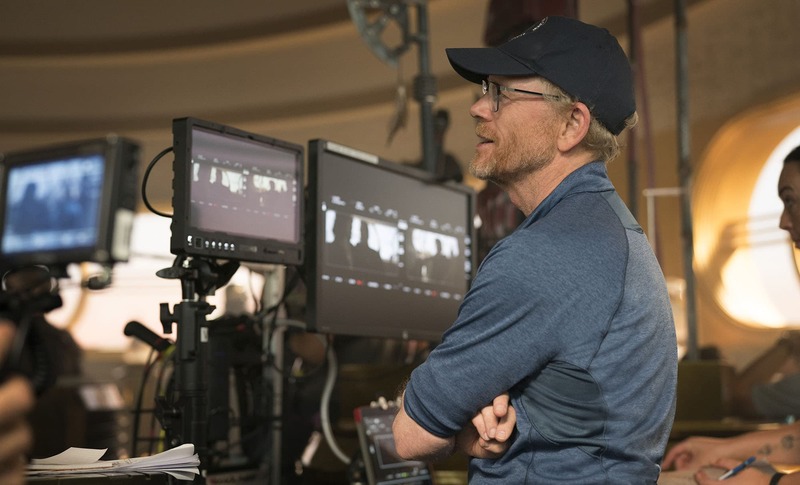 This was not to say Ron Howard was removed from the ILM team, as he is an 'actor's director' a lot of times we would give very specific notes on performance. For example, the character of Rio Durant was voiced by Jon Favreau. When he saw the first rough pass of animation of a shot that we might want to change, he would often do a read for the animators. In addition to Jon Favreau's voice, Howard "would do a read for us, and I would grab my iphone and just like record how he was doing it. So we had reference of the kind of emotion he was looking for. Or Ron would say, 'oh, no, okay, he's kind of being tricky here, but he's also trying to get a joke in the next line, so we need to set this up". This description would allow the animators to build for a later payoff. "But the greatest thing is while he always had a very specific thing he was going for, he also knew that there is always more than one way to achieve something". For Bredow, this meant having a very strong directorial vision, "a clarity of vision where he was taking the scene and he just wanted to make sure everything that you were doing to 'plus the scene', was fitting into that vision". Rob Bredow worked very closely to pre-visualize the Train Heist sequence with the The Third Floor in London. The team did the work in two phases. The first phase was the conceptual phase where the team worked out all the story beats and action. They then photographed the Dolomites, in Italy. A small team photographed the real mountains for the next stage of pre-viz. The terrain was photo modeled using about 25,000 photos. This represented about 125 to 150 square miles of the Dolomites, and it captured several canyons the team wanted for the sequence. The team then used these actual mountains, to pre visualize the scene "so we knew how it was going to actually play in the real location". In the second phase, once Bredow had more fully prevized the sequence, he went back to the real location and shot about 120 background plates for the movie. This was filmed with an Arri-65 in a nose mount of a helicopter. It took several days to get the correct footage as it had to be filmed in the right lighting conditions, which was either dawn or dusk. Luckily, the team decided against doing this with a drone rig. "It's actually very windy in the Dolomites and you're at a very high altitude", Bredow comments. "I was actually shooting there at the same time that a friend of mine was trying to shoot something for a theme park ride. He was there for a week with his drone, and he struggled to get one shot. We shot 120 shots in that same time because our Chopper could fly in a lot rougher weather. We really had the right tool for the job". In total, the visual effects crew spent approximately 44 hours of airtime in helicopters in the Dolomites and Fuerteventura scouting, shooting plates and photo-modeling. Once they had the background plates and the final detailed pre-viz mapped into those plates, they could finally film the actors on set. The train sequence was shot on a soundstage with that 360 degree wrap around a blue screen. On set there was a full scale train car and two halves of a train car, all mounted on a hydraulic system that can raise and lower it 30 feet in the air and tilt it over 95 degrees on its side. "The thing weighed many tons and the hydraulics could flip it on its side in about three seconds" Bredow remarked. In addition to the technical special effects tools such as giant wind machines, the team also used the real time N-Cam on set. This provided a simulation of the rest of the CG train cars and mountains for the DOP to frame the shots properly in camera. When the team left set each night after a day of filming, they would leave with the rough comped camera material all burned in for editorial. "This meant that editorial was able to cut with much more complete footage, and they did not just have to imagine what the train action looked like. They could actually see it, which really helped the creative process and speed things along through post " Bredow explained. 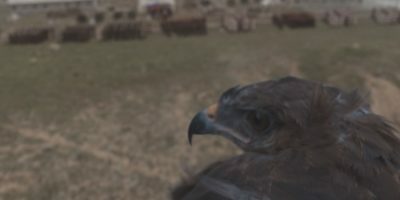 The on-set data wrangling team captured photo reference, witness camera data, and set survey data along with other reference information for all the various sets on Solo. This data totaled over about 40TB, all of which was sent to ILM to assist in creating the visual effects shots for the movie. 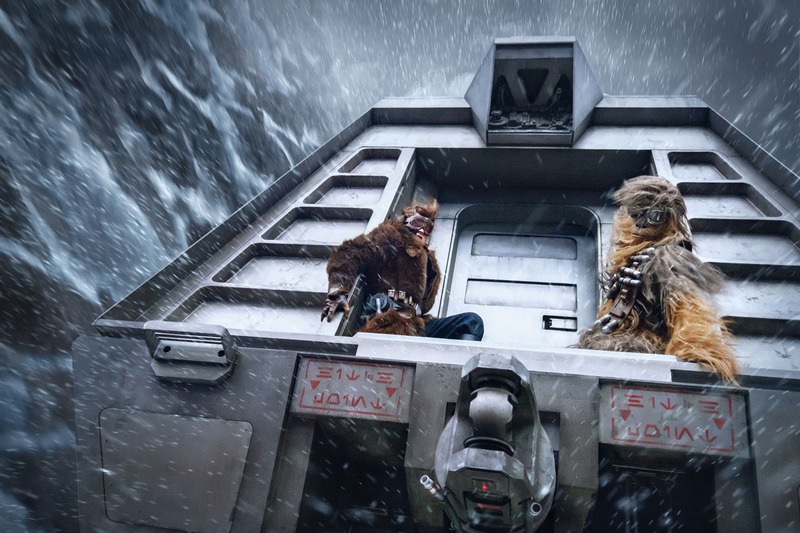 Throughout the course of the film, the visual effects team digitally scanned over 500 characters, props and sets, including the train from the Heist sequence. For the main actors, a reduced unit traveled to the Dolomites for a six-day shoot. The cast and crew took over the small village of Misurina, which sits some 1,756 meters above sea level and reflects the southeast slopes of Tre Cime di Lavaredo, the mountain cluster on which the unit shot. A daily convoy of helicopters, 4x4s and a team of robust and friendly alpine guides, the local Sherpas, ferried cast, crew and equipment up the mountains to an altitude of 2,400 meters. L3 is a custom self-made piloting droid 'owned' with Lando Calrissian. She was a one of a kind droid, assembling and improving herself with scraps of other droids which she pieced together. She is alone in the Star Wars Galaxy of Droids as being an advocate of Droid Rights. She would come, by the end of the film, to the intelligence of the Millennium Falcon. 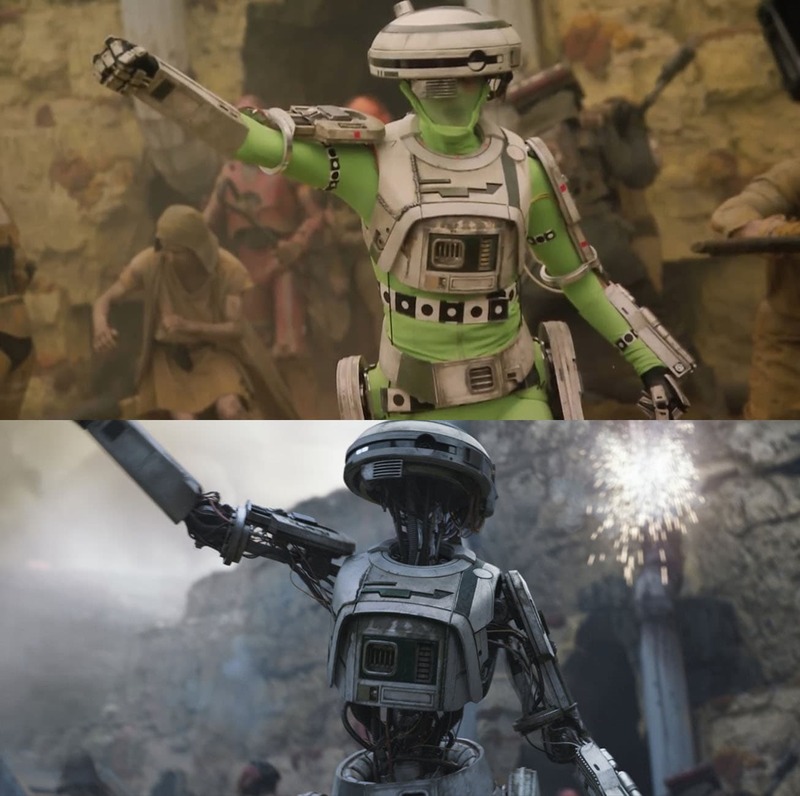 L3-37 is portrayed by Phoebe Waller-Bridge via motion-capture with additional hand animation and by augmented CGI. "Every shot, except for maybe two in the movie, we actually use the plate where Phoebe Waller-Bridge actually was and we painted her body out, while saving the bits that we captured in camera of the suit. The costume you see in the original photography, isn't just an onset reference, it was actually used in the final picture" explains Bredow. The head, chest, hips, legs and arms were kept where-ever possible. "The outside surfaces of the arms and legs were actually preserved from the direct photography, and then we carefully masked, and remove parts and added back the CG version parts of her". In some cases, it was easier to replace a leg or an arm with a full CG version but the team found the on set footage remarkably good. "The match was so good, I actually stopped halfway through asking which was which. At first I was really interested in what was CG and what was live action, because I wanted to make sure that we were honoring the performance and matching the live action. Then about halfway through, it became less important because we just couldn't tell the difference" he adds. As seen above Phoebe Waller-Bridge was wearing a partial ILM tracking MoCap suit, and while this was not enough for a full MoCap solution, the markers were enough to calculate the initial rigid body tracks for the various sections of her body. "But I'd have to say the vast majority of the work was very careful, artistic, matching frame by frame by our match movers. With L3 there was no one solution or single silver bullet. There was a variety of techniques we used to pull off those match moves and object tracking. In the end it came down to just very careful work by artists" Bredow recalls. "I suggest a new strategy, Artoo. Let the Wookiee win." In the original Episode IV one of the technically most complicated shots was the Holo Chess board, as all the layers were optical composites. The holo chess board is actually called the Dejarik Board in Star Wars lore. It was also seen in the Force Awakens, again as a Hologram, only this time it is Finn who is playing, or rather accidentally turn on the game, briefly. In Solo the game is on for longer than both of these two previous films combined. Phil Tippet both for the Force Awakens and Solo make the new character animation based on scans, casts and molds from the original (1977) versions. In the new film Solo, once again Chewbacca is playing the game, and as with the original, Phil Tippet did the stop frame animation, just like the original over forty years ago. Only this time there are more characters on the board game ! Amazingly, while filming Solo, Chewie took care of that fact, in what can only be described as to 'life imitating art'. Phil Tippett originally had two extra pieces on the 'New Hope Ep IV' holo chess board. When he set up the board for George Lucas for the original Star Wars, "George came on set, as Phil describes it to me, and he looked at the chess board and goes, 'ah, too many pieces. You should get rid of a couple'. So Lucas took off two of his least favorite pieces and just removed them from the game. Anyway, it's kind of been in the back of Phil's mind ever since". When Ron Howard asked Phil Tippet to do this show, and he understood where it fitted in the Star Wars timeline, Tippet suggested the idea to Ron to have the two characters be back on the board. They can be clearly seen in the middle of the board game. In the new film, Joonas Suotamo , who plays Chewie, slams the table, and, as luck would have it, buttons fell off the prop. This was the perfect event to have two of the characters on the board blink off, never to be seen again. The buttons falling off was purely a co-incidence. "Just by sheer luck when when Joonas hit the table really hard, two of the buttons popped off. So rather fixing that, which we would have normally done at ILM. The guys at Tippett pitched this idea that, 'what if he kinda damaged the chess table?'" 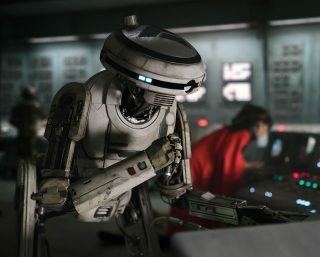 Note the loss of the two characters, that brings it to the state we see in Episode IV, (and the buttons that fall off). Trivia: Actually real statues, or non-holographic versions of Dejarik using physical pieces, was seen in a game being played In Star Wars: Rogue One. The new animation was done almost exactly how the original was done. "Actually this is the most Holo chest table that we've ever done in Star Wars" comments Bredow. "It's usually just been a couple of shots and here it was more than two dozen with probably 40 seconds of screen time. Which is quite a lot of stop motion animation". Bredow comments further that "this was one of those cases where the guys at Tippet studios really knew what they're doing. They did a fast blocking pass that we loved, we gave a couple of notes and they did the stop motion", he says, adding: - "You don't do a lot of takes in stop motion!" Bredow is actually in the film in one of many cameos in the film, he explains, "I am in the end of the spaceport scene. 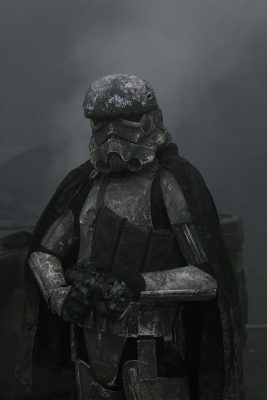 I am an Imperial Enlistment Officer but I'm only in one shot. It's a three shot, Alden (Ehrenreich / Han Solo) in the foreground and the Imperial Enlistment Officer, who gives Han Solo his name is on the left and I'm on the right. So, if you happen to be looking over the right half of the frame, that's me and I'm listening to someone in the Imperial Navy". Ron Howard always has his wife, Cheryl Howard in this films as a good luck charm or mascot. In this film she is in this same scene. Cheryl was added via green screen. When Han is looking at a Hologram that is inviting him to the Imperial enlistment, right before Bredow's cameo, one can see Ron Howard's wife as one of the people in the crowd. Ron Howard's rule of thumb is that his wife doesn't have to be really noticeable in the film, just in the film. "Interestingly, we had shot that plate, and while it looks like it could've been shot all in camera, (apart from the Hologram), we actually shot that background environment for something else. Originally, the shot had a droid projecting the hologram and thus it was significantly placed into the shot. 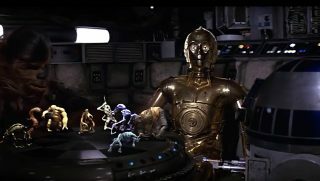 We actually used Ron Howard's wife to cover up the droid". The team also shot other elements to make that sequence work, adding the digital 3D hallway behind the Hologram. "Oh yeah, I've got another very detailed bit of trivia, " comments Bredow. "My family happens to be in that shot. They had moved to London with me for a year that I worked on the film and so they had signed up to be extras. They just happened to be in the background of that shot". In total, Rob Bredow oversaw the 2,000 visual effects shots for the film. Bredow and the global ILM team of 1,200+ artists and technicians created vehicles, character performances, environments and spacecraft. In part 2, we look at the new special technical set up, on set for filming both the Speer Race the Kessel Run sequence.